We’re re-doing our upstairs, which is a project that requires lots os manual labor. Going on the premise that a whole grain cookie would keep my energy level up, I decided to bake something from my King Arthur Whole Grain Baking book. A friend in L.A. recently made and loved KA’s “Nutty For Oats” cookies, so I decided to bake up a half batch. The cookies are very good, especially if you are looking for something semi-healthy and a bit lower in sugar. While there are candies in the dough, they add just enough sweetness to make the cookies dessert-worthy. You can use however many you wish. I used a little less than a cup total. I also made my cookies bigger than KA, and ended up with 12 big cookies. Preheat oven to 350 degrees F. Line 2 cookie sheets with non-stick foil or parchment. In a 2 quart mixing bowl, beat together peanut butter, softened butter and brown sugar. Stir in vanilla, salt, baking soda and egg. When those ingredients are well mixed, stir in ground up oats and whole oats. Finally, add candy. Drop the dough by rounded tablespoonfuls onto parchment or Release foil lined baking sheets. Bake for 11-13 minutes. Let the cookies cool completely on pans. Makes about 12 cookies (more if you use rounded teaspoonfuls). 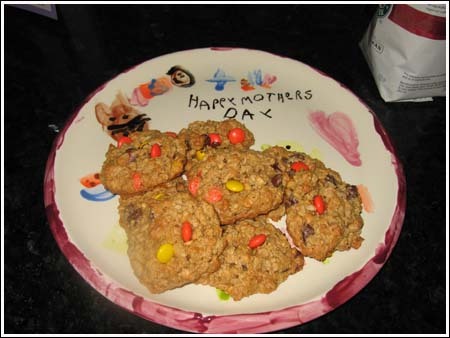 These are great– thanks for sharing the recipe! I love me some Reese’s pieces in cookies! Janet, thanks for feedback on the tiffin. That cookie was kind of new to me, so I’m glad to hear it worked out for you and that others liked it. Amy, I only made half a batch because I’m the only one in this house who likes peanut butter and oatmeal. I like that the recipe is easy to scale down. It could be made vegan too — one egg replacer, Earth Balance instead of butter and vegan chocolate such as Green & Black’s cut up…. How funny! I just got done e-mailing this recipe to a friend I made these for last week! She said her family loved them. They are wonderful even with plain old chocolate chips. They also stay moist for up to a week after baking (if for some reason they aren’t all gone by then). Hi Anna! I wanted to tell you how popular your Chocolate Tiffin bar recipe is…I made them this morning since we had a neighborhood garage sale and I could share them with my neighbors. It is a reallllly wonderful and VERY easy recipe to whip up. My folder of “Anna” recipes is so full and my neighbors love you because I am making many of them and they are enjoying the treats;-) Thanks for the inspiration and great recipes!!! BTW, I sub’d cranberries for the cherries. Used a german butter biscuit cookie. I have already been asked for the recipe so you know it’s a winner when everyone wants to make it! !